Minimise pores and fight the signs of ageing. This lightweight serum delivers a concentrated blend of antioxidants and retinol to protect skin from environmental damage and minimise visible signs of ageing. Ideal for combination and oily skin, the unique, weightless formula leaves skin balanced, healthy and clear. I've been using this serum for almost three months now and do think it's worked very well to balance out my combo skin. I've been using it in conjunction with the Balancing Cleanser and 2% Clear BHA Liquid every evening. I think the retinol in this product possible boosted the BHA, as my pores are definitely much cleaner. Skin feels lightly hydrated, and smooth after use and the product absorbs very fast. It also works well as a primer due to the smoothing, mattifying finish. I would really recommend this to those with oilier skin, looking for light hydration and great anti ageing ingredients. I deducted one star purely because I felt it wasn't quite enough for my drier parts. Still a great product and would repurchase. May be more suitable for the Summer months when my skin is on the oiler side. I didn't expect the texture of this serum the first time I used it, it's like a dry-oil and silicone combo, very similar to some makeup primers out there. It sinks quickly into the skin leaving a silky texture, the skin is smooth and nice. It's easy to use too much of the product since a little goes a long way due to the silky, silicone feel. The serum itself doesn't feel that moisturising or like it sinks deep into the skin, it also didn't go well together with other products that I use so when they were all applied together it just rolled and bundled up on my skin. This is the only retinol product I have tried. Try a sample tube first to see if you can tolerate it. I have an oily yet sensitive skin. I am using the BHA2% liquid and I use it every other or every three nights because my skin sometimes becomes flaky. I have been careful with this one also and can tolerate to use it every three nights. I don't use it with BHA exfoliant. Now when I'm used to it I haven't had flaking. I don't dare to use these products more often at this point. The serum is very good and the texture is something I have never used. It feels silky and you don't need much for entire face. Great to use in the daytime for oily skin. Just can't hide it : the smell is just FANTASTIC ! Customer Care: Thank you for your review! We're happy that you like the smell, all our products are fragrance free, therefore, that is the smell of the ingredients. Enjoy! this is a pretty good product but somehow silicone feels uncomfortable even if no make my skin greasy. In addition, keep in mind to mix the product before use. While I'm really satisfied with some other Paula's amazing products (I am currently using BHA and AHA exfoliants, moisturizer with sunscreen, all working very well) I regret to say that this one is really bad on my combination skin. the fact is that after some hours after application it breaks out. I tried four times in order to be sure that it was because of this product. every time I tested it, some kind of red pimples (slightly different from acne I suffered for when I was a teenager) appear on my face, lasting for days. Most probably it's because of the retinol (the dermatologist I went to after this experience told me that this ingredient is seldom the cause of bad reactions) but I am not sure about this. In any case I won't use this serum any more. Customer Care: It is hard to know exactly which ingredient, combination of ingredients, or outside factors contributed to your skin responding negatively to this product. It can be difficult to identify which ingredient in any formula, even a well-formulated one, which could be causing this type of reaction. Please contact Customer Care, if you need further assistance. Very nice silky consistency - leaves your skin with a smooth surface and your skin stays matte. I have combination skin og use most of the products in the Skin Balancing serie with a very, very good resultat - the best I've ever tried. Most nights I use the RESIST Anti-Aging serie because of my age. I've been using these products for a year and I confess myself a PC addict! I love almost all the products, but the Skin Balancing Serum is my favorite (I'm not being fair to my other darlings). The breathable texture of this serum is beyond reality. It gives me the security that I will not breakout, it works great as a primer and at the same time I'm taking care of other issues: wrinkles, discoloration... Even though mereley thinking about breaking out makes me breakout; yet with Skin Balancing SAC Serum, my skin feels and looks fantastic --humble me. I complement it with Earth Source Toner and Resist Anti Aging Clear Hydrator during winter. Keep the information flowing, you're doing a great job. Congratulations! Hello, I have ordered a few samples from this product and some other products as well. I was expecting a good result, but my skin is not tolerating this care line at all ( my skinn is combination to oily). The consistency of this concrete serum was just wrong - it reminded me of jelly (maybe my samples were expired - but this can`t be an excuse...) So sorry, so dissapointed. Customer Care : Thank you for your e-mail. We regret to hear that you are not pleased with the consistency of the serum. This Skin Balancing serum is specially developped for the oily combination skin and therefore it has been chosen for this consistency. This serum makes my skin so soft and smooth. It spreads out good, I quite like the texture. It's like a souffle, touch it and it disappears, haha. You have to work it in quite rapidly I suppose. But that is why it doesn't leave skin oily and slick, it just absorbs instantly. I'm not sure if it has made a significant change on my skin yet, I've been using it a few months. But I think in the long run this benefits my skin. I'm still young (23) so I don't really have any wrinkles yet but I use this to prevent them and this serum feels gorgeous. I've exclusively used Paula's products only on my face face for over 5years now and this is the first product that has been a disappointment. I have combination skin with large pores on my nose and forehead which are also very oily. I was using RESIST range for some time which worked well but as we hade a reasonably warm summer in the UK this year I wanted to try something that will make me look less greasy and shiny. Well this product did BUT I started having loads of blackheads which RESIST range got rid off and my skin, especially around eye area started looking very wrinkly and old. I don't know which one but some ingredient/s were definitely giving me skin issues. I guess I will just have to endure shiny face instead.... Customer Care: We are sorry to hear of your experience. We kindly advise to try out RESIST Ultra-Light Super Antioxidant Concentrate Serum to see how your skin responds. I really wanted this product to be a miracle and I saw myself in a few years to tell me that I was lucky to find a product to prevent aging. But after only 3 days of use, I found myself with tons of blackheads that I had eliminated with other products of the brand. Really, I love all of Paula's Choice products but this one, and I regret to say that but it is true. Customer Care: we are sorry to hear of your experience. While this response is not typical, we do understand that each customer is uniquely different in how they will respond to products or ingredients. We will contact you for a refund. I've been using this serum for about a month now on my combination skin. It's perfect under makeup, it provides a matte, smooth surface, no need for a separate primer. A delight to use. Truly one of the best serums I have ever tried. Awesome texture, instant absorption - best for even the oiliest skin type - and last but not least: it 100% does what it claims (from the very first number of uses)! I will definitely continue to purchase this!!! I have mixed-feeling about this product. When I tried the sample, it really worked, my skin remained mate all day so I purchased it. I'm really disappointed because the texture is totally different : with the sample, it was dry and instantly disappeared on my skin but now the texture is oily and unfortunately my skin become greasy again after only a couple of hours.Customer Care : Thank you for your review and we are sorry to hear that you are disappointed. Our Customer care will contact you for a suitable solution. Martin - It's okay, would buy again. I'm uncertain whether I've seen noticeable effects from this serum, and, I find it very hard to apply... It sort of disappears as soon as you touch anything! Though the skin feels smooth once applied -- though I think I use to much, and it makes it easier to apply whatever comes after because the skin's all silky and slippery due to the silicone. The packaging could use some work, but, on the whole I'm satisfied with the serum. As I run out of the tube I have now, I will probably buy a new one. the texture is really smoothe and nice, and after a few seconds it turns matte, but not overly dry at all. like it has not been mixed well enough together, i tried to shake the bottle but it didnt help..but it does not do this all the time, its a bit strange.Customer Care: Thank you for your feedback. On the backside of the tube as well as on the website we do advise to shake the product well before using. jenny - i like it! Great product. Only need a very little bit. Put it on quickly, because otherwise it evaporates! When you put it on it feels a bit oily, but that's only a few seconds. Skin absorbs the concentrate very quickly. Never felt anything like it! I don't like the smell, it's a bit sour, but i always put a misturizer on after this, so thet's no problem. I think next time i will try the resist-serum.....can't wait! This formula has lots of super ingredients but it made my skin feel greasy as the silicone formed a film. If you want a product for oily skin I really recommend the Skin Balancing Moisture Gel which leaves no residue at all. Nicky34 - Great for oily/acne prone skin. Carotenoid (carotene pigment) found in plants, algae, and fish, particularly salmon, that functions as a potent antioxidant. Plant extract that has skin-soothing benefits for skin. Cyclopentasiloxane (hydration), Isododecane (texture-enhancing), Cyclohexasiloxane (hydration), Neopentyl Glycol Diheptanoate (texture-enhancing), Dimethicone Crosspolymer (texture-enhancing), Retinyl Palmitate (vitamin A/antioxidant), Caprylic/Capric Triglyceride (emollient/texture-enhancing), Tocopheryl Acetate (vitamin E/antioxidant), Retinol (antioxidant/skin-restoring), Tetrahexyldecyl Ascorbate (vitamin C/antioxidant), Astaxanthin (antioxidant), Bisabolol (skin-soothing), Chamomilla Recutita (Matricaria) Extract (skin-soothing), Camellia Sinensis (Green Tea) Leaf Extract (antioxidant), Camellia Oleifera (Green Tea) Leaf Extract (antioxidant), xilaS Alba (Willow) Bark Extract (skin-soothing), Vitis Vinifera (Grape) Seed Extract (antioxidant), Ginkgo Biloba (Ginkgo) Leaf Extract (antioxidant), Calluna Vulgaris (Heather) Extract (antioxidant), Vaccinium Macrocarpon (Cranberry) Fruit Extract (antioxidant), Rubus Idaeus (Raspberry) Fruit Extract (antioxidant), Betula Alba (Birch) Bark Extract (antioxidant), Glycine Soja (Soybean) Oil (non-fragrant oil/antioxidant), Silica (texture-enhancing), Phenoxyethanol (preservative). 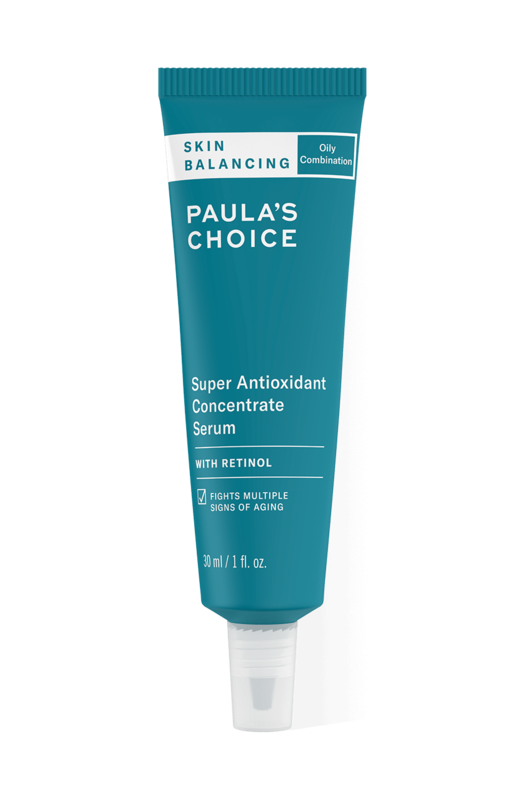 How does the Skin Balancing Super Antioxidant Concentrate Serum differ from the other retinol products Paula’s Choice offers? The silky, weightless Skin Balancing Super Antioxidant Concentrate Serum is best for combination to oily skin types. It contains several antioxidants (including vitamins C & E, green tea, willow leaf and grapeseed) as well as retinol. The percentage of retinol needed for efficacy is generally between 0.01% and 1%, which is quite a range, but further proof of just how powerful retinol is! All our products with retinol may be used with Skin Balancing Super Antioxidant Concentrate Serum or on their own, as each treats skin to a beneficial range of anti-ageing ingredients. Does Skin Balancing Super Antioxidant Concentrate Serum decrease the appearance of pores? The silicone polymers in Skin Balancing Super Antioxidant Concentrate Serum float over skin and minimally ‘fill in’ pores, creating a smoother surface. The effect is temporary and how long it lasts depends on your pore size and skin's oil production, as well as other products used at the same time. Overall, this product is not capable of reducing pore size, but it can diminish the appearance of enlarged pores. You can reduce enlarged pores by not using heavy, greasy products and using a well formulated BHA exfoliant along with other key ingredients found in our Skin Balancing line. Is Skin Balancing Super Antioxidant Concentrate Serum suitable for those with rosacea? Research has shown that retinol can reduce inflammation that leads to symptoms of rosacea. The antioxidants and soothing agents in Skin Balancing Super Antioxidant Concentrate Serum will help calm redness and soothe skin as they deliver anti-ageing benefits.